According to Jiji Press and other sources, the weekly magazine Shukan Shincho, was getting ready to print a story involving Matsushita and an affair involving a woman. Shukan Shincho editors were not available to comment. The last time a cabinet minister committed suicide was in 2007, when agriculture minister Toshikatsu Matsuoka hanged himself after allegations of fiscal misconduct. 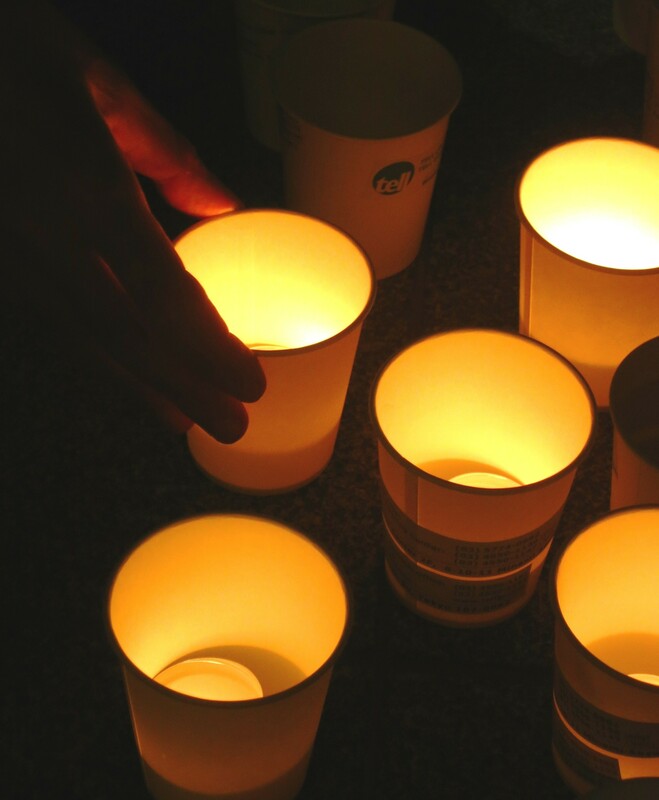 The timing of Matsushita’s death underlines the scale of Japan’s suicide problem. Japan has one of the highest suicide rates in the world, according to the World Health Organization. Despite laws and outlines adopted by the government to tackle Japan’s high suicide rate, the number of suicides has remained over 30,000 per year for 14 years. While there have been rises and ebbs, the numbers stay high even as Japan’s population continues to shrink. Suicide hotlines in Japan are so overloaded that getting through to a live operator can take thirty or more calls. Many don’t have that patience. And there’s a new documentary released in Japan this week that examines why the Japanese government is unable to significantly reduce Japan’s high suicide rates. Suicide in Japan does not have the same nuance it does in the West. It’s not a religious taboo. The Japanese have a curious history of finding beauty in the act of suicide. Taking one’s life is sometimes considered more heroic than defeat. The Japanese word for the act is remarkably straight-forward: 自殺 (ji-satsu). It literally means “kill” (殺) “oneself“(自)”. Few-euphemisms are used for the word. Suicide in Japan has a long tradition of being a means of apology, protest, means of taking revenge, and dealing with illness. Life Insurance Spurs People To End Their Lives? Rene Duignan, director of the documentary Saving 10,000: Winning a War on Suicide in Japan which was released in Tokyo just prior to Suicide Prevention Day says: “Nobody tries to highlight the real problems and most importantly what to do about them.” Mr. Duignan explained his reasons for putting the documentary together as follows, “A complete sense of desperation about the apparent hopelessness of the suicide situation pushed me to buy a movie camera and ask a 22 year old former student of mine to operate it. It was a completely ridiculous thing to attempt. Most documentaries on this topic like to show corpses and feed on the tears of tragedy, I call them tragedy vampires. Nobody tries to highlight the real problems and most importantly what to do about them. I planned to interview 10 people but it turned out to be 100. I think people like underdogs and admired the complete futility of the task we were attempting so very few turned down our request for interviews. With so many people helping out, I think we can call this movie a genuine grassroots effort.” Tokyo English Life Line, which offers free counseling and emotional support on its Life Line, had the first-ever screening of the film as part of raising awareness of World Suicide Prevention Day. 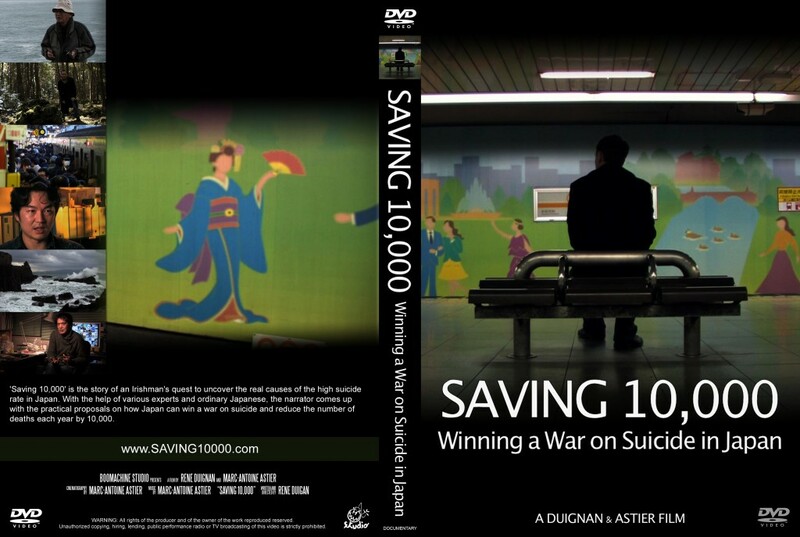 Saving 10,000: Winning A War On Suicide in Japan examines the cultural/ financial incentives to commit suicide in Nippon. In post-war Japan, people would sign a life insurance contract. And go straight out, and kill themselves under the nearest train. Eventually, the life insurance companies started putting in one-year exemption clauses in their policies, so people would sign a contract and they must wait one year before killing themselves to get the money. It was still a very good deal for desperate people, so the suicide rate spiked on the thirteenth month. The insurance companies extended the exemption period to two years. The result was that suicides spiked on the twenty-fifth month of the contract. Insurance agencies and the police say some men laid off from jobs have killed themselves to enable their families to live in comfort. “Japan has no law mandating how insurance companies deal with policy holders’ suicides,” said Masaru Tanabe, spokesman for the Life Insurance Association of Japan famously told the Associated Press in 1999. In March 2004, the Japanese Supreme Court ruled that insurers “must pay for suicides” if the death occurs within the terms of the insurance agreement. Novels, movies and the spread of the Internet suicide chat rooms have contributed to the suicide boom in Japan. They have also popularized some areas as suicide landmarks. A forest near the Mount Fuji became the ideal site for committing suicide when a 1960s novel by Seichō Matsumoto was published. The novel tells a story of a couple who meets their end in Aokigahara forest. Others attribute an increase in the number of suicides to Wataru Tsurumi’s description of Jukai (the ocean of trees) as “the perfect place to die” in his 1993 perennial best-selling book The Complete Manual of Suicide. Both books are reportedly often found along with human remains in the forest. The manual of suicide seems to have been written in a way to “encourage” readers to choose an easy way of getting rid of problems. “If your children have a copy of that book in their room, you should be aware that something might be going wrong in his life, and do everything possible to prevent suicide by detecting early signs of suicide,” says Duignan. There is one question that Saving 10,000 does not examine in depth. It’s the possibility that many so-called suicides are actually homicides. In 2010, the Yomiuri Shimbun, Japan’s largest paper reported that police conducted autopsies in only 4.4 percent of the cases determined to be suicides the year before. The lack of proper autopsies was only brought to the attention of the media after a several cases of a killer being caught after successfully staging murders as suicides. Sometimes suicides are only found to be murders after a criminal confesses his or her past crimes to the police. Suspicious deaths in Japan only have a 10 percent autopsy rate compared to 50 percent in the United States. According to the National Police Agency, since 1998, there have been 16 cases of “overlooked” deaths that later turned out to be murders committed for gaining life insurance money. There is a serious shortage of medical examiners nationwide, resulting in low autopsy rates. As a result, and as noted above, the Japanese Police have faced as series of embarrassing cases that were first ruled to be natural deaths or suicides by the authorities and later discovered to be homicide. The most recent case was that of Kanae Kijima, who was believed to have killed at least three men after swindling them out of their money. The first deaths were ruled as suicides. She was convicted of murder this year and sentenced to hang. She might have been arrested if the police had only done an autopsy on her first, in 2009. It has been pointed out many time, that Japan’s low autopsy rate makes it possible to disguise a murder under the guise of suicide. The case is well argued in Low autopsy rate seen abetting murderers by Natsuko Fukue, in The Japan Times. A National Police Agency source speculates, “the number of murders disguised as self-killings that have come to light are probably only the tip of the iceberg.” There are some experts that suggest that up to 5% of Japan’s reported suicides are actually homicides. There’s no doubt that people are killed and the murders sometimes staged as suicides so the criminal can collect the insurance money. But very often, the simple truth is the insured kill themselves for the sake of their family or to pay off their debts. Debt and economic troubles were blamed for the death of about 8,500 people in 2000, a fourfold increase from a decade earlier. Many victims had gotten into trouble with debt collectors or people that owned companies that went bankrupt. With Japan’s finance laws, when a company goes bankrupt, the individuals who owned it or were guarantors for the firm are deemed responsible and they go bankrupt too. Japan’s consumer loan industry and loan sharks, both who often have yakuza connections aggravate the situation, by preying on the financially destitute. The loan sharks and/or the servicers will sometimes goad a debtor to kill themselves so that they can claim the money owed, from the family, after the life insurance is paid off. Insurance agencies and the police say some men laid off from jobs have killed themselves to enable their families to live in comfort. “Japan has no law mandating how insurance companies deal with policy holders’ suicides,” said Masaru Tanabe, spokesman for the Life Insurance Association of Japan famously told the Associated Press in 1999. In March 2004, the Japanese Supreme Court ruled that insurers “must pay for suicides” if the death occurs within the terms of the insurance agreement. In 2006, during a session of the Diet, in reply to a question from a DPJ representative, the Financial Services Agency admitted that Japan’s 5 largest consumer loan companies had been the beneficiaries of 3,649 debtors who had committed suicide (for the fiscal year 2005). In other words, Promise, Takefuji, Aiful and others were able to claim the money owed them from the life insurance pay-offs—after the borrower killed themselves. Of course, the number of people who had been driven to commit suicide by “illegal” loan sharks was unknown. The lessons to be learned from the documentary are many but the primary point seems simple to understand: the exclusion of suicide from death benefits would probably greatly enhance suicide prevention. It wouldn’t change the Japanese cultural viewpoints on suicide as an acceptable means of dealing with a problem but it would remove the financial incentive and that might be a good start. "Better to light a single candle then curse the darkness a thousand times." I would like to thank you Jake for focusing on how to prevent suicide and reduce the unnecessarily high suicide rate in Japan. As I am sure you are aware most media articles have focused on the another ‘how’ of the methods that people have used to kill themselvescover the 14 years since the rate increased by around 35 percent, and since 1998 the number of people killing themselves each year in Japan has consistently remained over 30,000. I would also like to suggest that since many Japanese have high reading skills in English, any articles dealing with mental health issues in Japan provide contact details for hotlines and support services for people who are depressed and feeling suicidal. Hope this may be of some interest and help and thanks again for your through and caring article. I did put some links to Tokyo Life Line in the article but this is helpful. I probably should add a section on “How To Save A Life”. I totally agree to the reporters and many well wishers point about reducing the suicide rate. I however do not completely agree to Saving 10000 idea about removing suicide from life insurance claims. If you do so wont the number of suicide rate increase i.e. the whole family along with young kids (future generation) might fall in to the killer debt trap. Here’s what I don’t get Eric. What do you have against Suicide? Why this tone of joy about a documentary, which is trying to undo insurance policies? In the states, the policies are also 2 year based. Yet, no one sees any statistically significant increases in suicide. The problem is the Japanese, not insurance policies. inochi no denwa is so useless, they’ve made me feel worse. I’ll never ever call them again. I’m sorry to hear that. How did they make you feel worse? Suicide is self-killing but it sound more sympathetic when you call it suicide. In my opinion, after dealing with financial industry about a decade, financial crises are one of the biggest cause of suicides AND killing worldwide. The other big factor is the media that portrays American movies as heroes and taking a shot just sounds very interesting and heroic. I believe Japanese are a strong nation and this rate should eventually reduce, the similar way when that famous old Japanese blind lady fell on the rail track and they developed the whole medical system to avoid such losses. I am sure they are going to find a way to reduce this stress as well. Thanks for sharing eye-opening article. (1) In contrast to the Tanabe quote of 1999, there has actually always been a statute regulating the consequences of suicide for life insurance coverage – article 51 No. 1 保険法 (formerly art. 680 商法) stipulates that there is no obligation to pay in cases of suicide. This provision is, however, according to a Supreme Court judgment of 25/03/2004, overridden by the insurance companies’ general terms and conditions, which usually provide for a payment once a three year grace period has lapsed. (2) In contrast to the movie’s and your conclusion, there already has been a legal reform of the kind that is demanded – article 12-7 貸金業法, which was added in 2006 and came into force already in 2010, bans so-called suicide-insurance in connection with “sarakin” moneylenders’ loan contracts. This applies mutatis mutandis to “toritate-ya” debt-collection companies and for guarantors and is complemented by requirements of information, etc., articles 24, 24-2, 24-3, 24-4, 24-5 of the same act.